Automatic process controls provide absolute precision and critical strength. Cannon is equipped to provide MIG, TIG and spot welding. Fast, clean, strong, reliable welds. These are the state-of-the-art welding advancements you’ll find at Cannon Industries. Equipment from Miller & Hobart, and a Peer air operated press type spot welder give Cannon the capability to provide dependable, accurate welds for jobs of any volume. Our custom-made thermal staking machine has automatic process controls that make absolute precision and critical strength possible. Cannon is equipped for MIG, TIG, and spot welding, providing the right welding application for the requirements of your job. Fabworld II Cell Assembly with dual MHT-450 Positioners and UP20-6 Welding Robot with XRC2001 Controller. 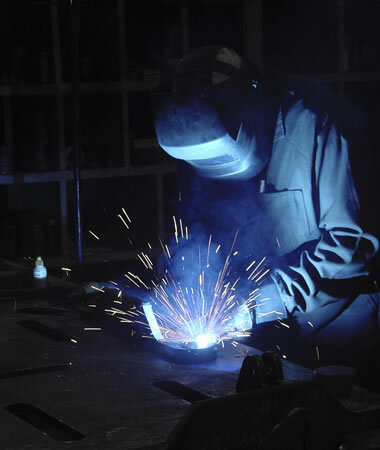 Fast, clean, strong, reliable welds are the state of the art welding advancements you’ll find at Cannon.